Is it not time you threw away those static posters and chalk board menus? Do you want to save print costs and have more time to concentrate on other things in your business? Then add some digital signage to your venue and bring it into the 21st century. Small businesses, especially retailers, spend large sums of money having new static posters made each time a new product is launched or existing stock items are put on sale. The whole process from printing, to removal of old posters and installing new ones is time consuming and expensive. With a small single investment up front, small businesses can have the ease and flexibility of a digital signage system that will allow owners and their staff to update and manage their new product lines and promotional offers in a simple and cost effective way. Static posters are by definition static. Their content and design is fixed and if printed incorrect or a change is required, then its back to the printers for a new copy. They also only show a singular advertisement and provide no flexibility to be changed easily. With a dynamic digital poster the impact is immediate. Images come to life and videos attract. Customers are drawn to look at the content on show and are influenced by this dynamic information. It is well known today that retailers for example, see uplift in sales following digital signage installations when displays are placed in prominent places combined with eye catching targeted material. Digital signage puts your advertising campaigns firmly in the present. Centrally managed, the system user is in full control and content can be update regularly, scheduled for different promotions or offers, giving flexibility to the venue owner and staff. You have a successful business and frequently get long queues of customers waiting. This can lead to frustration and complaints. By installing a digital signage screen customers will look at the screen, as it is a familiar item like watching TV at home. This gives you an ideal time to deliver your messages and keep the customers informed. 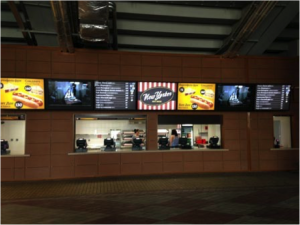 As an example we will use food outlet that currently has some static posters and chalk boards displaying prices. This is functional but not really engaging for your customers. Why not provide them with great images and videos of the foods you sell on a digital display. Steaming hot coffee and a large chocolate muffin get the taste buds going even before your customers have reached the counter. This eye-catching information may also influence the buyer into purchasing something extra. What about your latest meal deal, discounted offers, or customer loyalty promotions. You decide what is shown and make a change when you like. 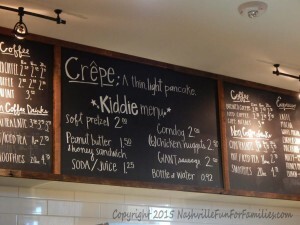 You have a price increase or new item on the menu? Make a simple and quick change to the display saving you time and money via static posters. Want to learn more about digital signage and how it could transform your business? Then get in touch with Dynamax and learn how our cloud based digitalsignage.NET product is improving the lives of business owners today. This entry was posted in Digital Signage, Entertainment, Hospitality, Marketing and Advertising, Retail and tagged #digitalsignage, digital signage, digital signage advertising, digital signage for hospitality, digital signage software, retail digital signage by Dynamax. Bookmark the permalink.